Explaining Chiropractic has ALWAYS been a challenge until 1976 when the Neuropatholator was born. The Neuropatholator is an amazing tool that generates referrals, retention and educates your valuable patients. All the time Docs tell us about the many benefits of using their Neuropatholator Wall Chart. They tell us they wouldn’t practice without it! Now, the Neuropatholator Experience is EVEN MORE POWERFUL because of computers. 1st Benefit: It’s FAST. As a matter of fact, it’s just as fast as the Neuropatholator Wall Chart. You get all the responsiveness of a wall chart when you click a vertebral level (or tap a touchscreen). Just like the wall chart, the Nerves and Organs flash immediately. Better than the chart, you also see animated nerve flow and pulsation. You save time because in just 8-seconds to 1-minute per visit, your patient gains a crystal clear understanding of Chiropractic. 2nd Benefit: You will have an Encyclopedia of Chiropractic Info at your fingertips. 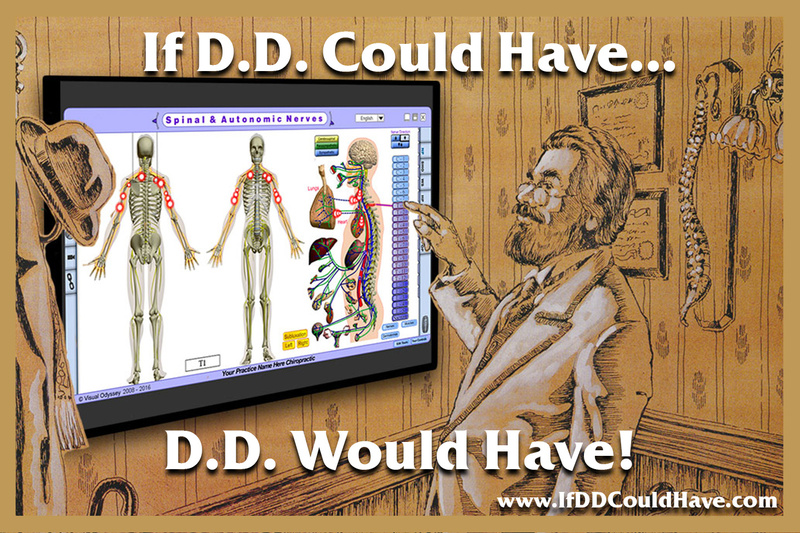 With a computer, you will easily go many magnitudes of patient education info deeper with hundreds of additional topics, animations, videos and interactivity ALL about Chiropractic. And all within 2 or 3 clicks of our super intuitive navigation system. 4th Benefit: Make it as large or as portable as you desire. The Neuropatholator Software can be shown on a 70” TV or a laptop or iPad. We have solutions for every office. Whether you use one in your ROF room, adjusting room, the reception room or the hall, you’ll witness a growth in referrals and follow-through. Patient Proven Pleasure! Click here to learn about the difference between the Neuropatholator Wall Chart and the Software. “This note is long over due. I’ve had your products since its inception (the 1970’s) & now have 5 of them Plus the software. It has helped me educate my patients over the years and increased my PVA’s, not by 5-10 but by 50-60 more visits per patient, thus helping me maintain a high volume practice since the 70’s. More than any other educational tool. I also use your Neuropatholator Software on my adjusting computers all day long. Reality Check: Perhaps you already believe that the method you currently use generates more patients and additional appointments. But the truth is, the Neuropatholator Touch will boost you to a whole new level. Are you ready? “If you are not using the awesome “aha moment” power that Neuropatholator software provides your patients, this is your chance. We have used Neuropatholators since 1982 and would not practice without them. “The software version is packed with so much patient “Visual WOW!” you will be amazed how well patients see for themselves what you are trying to tell them. Please do not deny them the Neuropatholator’s powerful educational impact. It’s for your patients’ benefit, so they can see and place your Chiropractic care in the “Necessary Healthcare” category on their priority & budget list. Get yours TODAY. From only $397 for the Starter which = the Wall Chart. You get 40 years of Visual Odyssey experience in instant, dramatic patient education. You get the same immense customer satisfaction that has been overwhelmingly demonstrated in over 30 countries!!! You get lots of new patients with this nearly unlimited potential. You enjoy patients who follow through because they understand that it’s the ‘naturally right’ thing to do. You get a tool that continues to perform all day long. Oh, I almost forgot the best part: Finally, if there were NO RISK except the shipping outside the US, would there be any reason not to place your name on the “Ship ASAP board” and have yours on its way to you right away? Here is your “safety valve investment insurance”. If, for any reason, your Neuropatholator Touch Software does not pay for itself in 3 months… that’s 90 days… when used everyday with your patients… we will buy it back! You do your part by using it every day and it WILL perform fabulously for you. Call Now! or visit neuropatholator.com . . . Your practice will thank you.